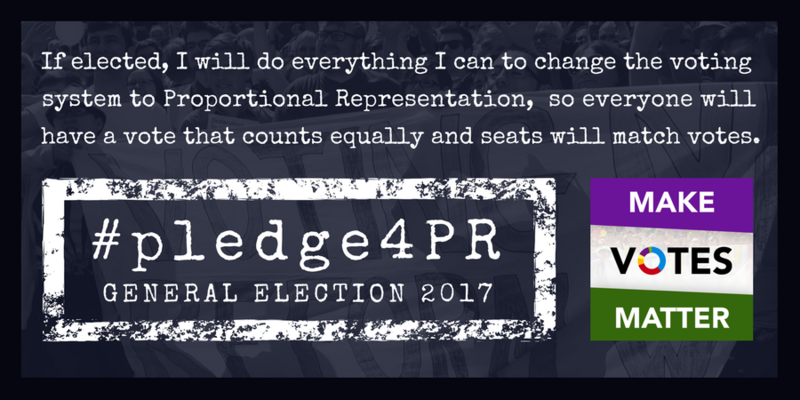 Let's change the voting system to Proportional Representation - #Pledge4PR! Click the button, enter your postcode and click "find your candidates". You will then be given BOTH pre-written tweets, and email addresses for all your candidates. If you use Twitter, it is the quickest and most visible way to message your candidates. If you don't use Twitter you can copy your candidates' emails from the same page and include the text below in an email. I am writing to ask that you pledge to support Proportional Representation for elections to the House of Commons if elected. Please visit www.makevotesmatter.org.uk/pledge4pr and share the pledge card on Twitter and Facebook to show your commitment to fair votes! If you're standing to become an MP, please share the pledge card to show your commitment to a fair votes. Download the pledge card or click one of the buttons to share directly.